Challenge Qui-Gon Jinn to the dual of his life with this Darth Maul lightsaber! It has two light-up red blades (requires two AA batteries - not included) and each blade has its own on/off switch. This deluxe lightsaber measures 5 feet long when both blades are extended so you are sure to win any duel you enter into. 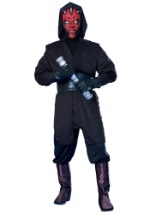 Complete your look with any of our Darth Maul costumes and masks!